Testosterone propionate, after testosterone cypionate and enanthate, is the third injectable testosterone ester that needs to be described in detail. This makes sense because, unlike cypionate and enanthate, both of which are widely used and well-spread in Europe, proprionate is little noticed by most athlets. At a first glance this might seem a little unusual but when looking at this substance more closely, there are several reasons that become clear. Testosterone propionate is used on so few occasions in weightlifting, powerlifting, and bodybuilding not because it is ineffective. On the contrary, most do not know about propionate and its application potential. One acts according to the mottos "what you don't know won't hurt you" and "If others don't use, it can't be any good." We do not want to go this far and call propionate the most effective testosterone ester; however, in certain applications it is superior to enanthate, cypionate, and also undecanoate because it has characteristics which the common testosterones do not have. The main difference between propionate, cypionate, and enanthate is the respective duration of effect. In contrast to the long-acting enanthate and cypionate depot steroids, propionate has a distinctly lower duration of effect. Testosterone proprionate has a duration of effect of 1 to 2 days. Propionate is only a quickly effective testosterone that must be injected more often. Based on the highly androgenic effect, propionate as well as enanthate and cypionate is very appropriate for the build up of strength and muscle mass. An eye-catching difference, however, is that the athlete "draws" distinctly less water with propionate and visibly lower water retention occurs. Since propionate is quickly effective, often after only one or two days, the athlete experience an increase of his training energy, a better pump, an increased appetite, and a slight strength gain. As an initial dose most athletes prefer a 50-100 mg injection. Those who cannot wait until the depot steroids become effective inject 250mg of Testosterone enanthate and 50 mg of Testosterone propionate at the beginning of the treatment. After two days, when the effect of the propionates decreases, another 50 mg ampule is injected. Two days after that, the elevated testosterone level caused by the propionate begins to decrease. By that time, the effect of the enanthates in the body would be present, no further propionate injections would be necessary. 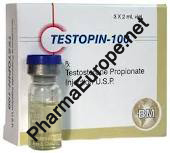 Thus the athlete rapidly reaches and maintains a high testosterone level for a long time due to the depot testo. This, for example, is important for athletes who with Anadrol 50 over the six-week treatment have gained several pounds and would now like to switch to testosterone. Since Anadrol 50 begin its "breakdown" shortly after use of the compound is discontinued, a fast and elevated testosterone level is desirable. Women especially like propionate since, when applied properly,androgenic-caused side effects can be avoided more easily. The trick is to increase the time intervals between the various injections so that the testosterone level can fall again and so there is an accumulation of androgens in the female organism. Women therefore take propionate only every 5-7 days and obtain remarkable results with it. The androgenic effect included in the propionate allows better regeneration without virilization symptoms for hard-training women. The dosage is usually 25-50 mg/injection. Higher dosages and more frequent intervals of intake would certainly show even better results but are not recommended for women. The duration of intake should not exceed 8-10 weeks and can be supplemented by taking mild and mostly anabolic steroids such as, for example, Primobolan, Durabolin, and Anadur in order to promote the synthesis of protein. Men who do not fear the intake of testosteron or the possible side effects should go ahead and give propionate a try. The side effects of propionate are usually less frequent and are less pronounced. The reason is that the weekly dose of propionate is usually much lower than with depot testosterones. A daily injection of 50 mg amounts to a weekly dose of 350 mg while several depot injections easily launch the milligram content of testosterone into the four-figure range. When compared with enanthate and cypionate, propionate is also a milder substance and thus better tolerated in the body. Those who are convinced that they need daily testosterone injections should consider taking propionate. The key to success with propionate lies in the regular intake of relatively small quantites (50-100 mg every 1-2 days). Although the side effects of propionate are similar to the ones of enanthate and cypionate these, as already mentioned, occur less frequently. However, if there is a predisposition and very high dosages are taken, the known androgenic-linked side effects such as acne vulgaris, accelerated hair loss, increased growth of body hair and deep voice can occur. An increased libido is common both in men and women with the use of propionate. Despite the high conversion rate of propionate into estrogen gynecomastia is less common than with other testosterones. The same is true for possible water retention since the retention of electrolytes and water is less pronounced. The administration of testosterone stimulating compounds such as HCG and Clomid can, however also be advised with propionate use since it has a strong influence on the hypothalamohypophysial testicular axis, suppressing the endogenous hormone production. The toxic influence on the liver is minimal so that a liver damage is unlikely. What athletes dislike most about propionate are the frequent injections that are necessary.